Many people in Newark will remember Madame Cooke’s shop which stood at No 6 Market Place, just to the right of the entrance to Chain Lane . Described as court dressmaker and “costumier to the best class of lady residents,” Madame Cooke’s emporium really was the Newark equivalent of television’s House of Elliott. During the shop’s 60-year history, however, there were in fact two ladies who assumed that role, for when Mrs Robinson retired, management of the business passed to her Miss Sarah Jackson. It was she who carried on the business until its eventual closure soon after the Second World War in about 1949. Right from the outset, Madame Cooke & Co. (as the business should properly be referred to) set about establishing a reputation as one of Newark ’s premier stores. Quite apart from the prominent plate glass display window (a rare and expensive commodity in those days, and tastefully hung with old gold plush), the interior of the shop was described as on a par with any of the best fashion houses in Paris ’s Rue de la Paix. The company’s stock in trade was the production and retail of the very finest in ladies’ attire, including dress and mantle materials and all the latest corsetry. 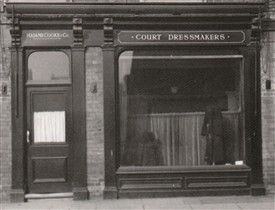 Agents in London and Paris constantly kept the Newark shop up-to-date, and Madame Cooke’s came to be not only the premier ladies’ costumier in Newark , but also acquired a considerable reputation nationwide. Her trading links spanned the length and breadth of the country and clients regularly travelled to Newark from as far afield as Scotland . Although the company did not actually work for royalty, it did supply garments to members of the royal entourage, including ladies-in-waiting, the wives of equerries, and numerous countesses and duchesses. Many of these robes were made on the premises by her own seamstresses in a large open room on the third floor where up to 30 qualified workers and apprentices worked from 8.45am to 6.00pm six days a week. In payment, apprentices in the Twenties would receive 2s.6d. (12 ½ p) per week. A fully qualified head seamstress could expect to earn 38s.6d. (about £2.00). The large top floor room was divided into three distinct work areas, known as the Skirt Room, Coat Room and Bodice Room, the latter two sharing a large rough table covered with brown paper. Cutting and pressing tables (employing a relay of four flat irons heated on a single glass ring) were ranged around the walls. To produce garments of the highest quality virtually all sewing was done by hand, and one former employee from the Twenties recalled taking a fortnight to hand embroider a georgette evening coat and shawl. The only concession to mechanisation was a solitary, antiquated Singer sewing machine which could be used when speed was of the essence, for example when producing mourning clothes. Downstairs, however, in the rooms where clients were received, conditions were altogether more salubrious. Below the workroom, on the first floor, were two plush fitting rooms, decorated to resemble private sitting rooms, where clients would be entertained whilst discussing or choosing a new dress. 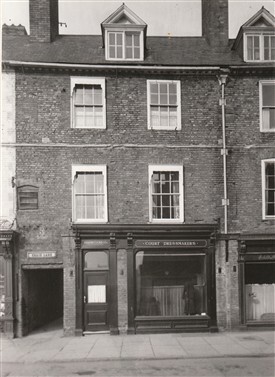 The front fitting room (overlooking The Market Place) was reserved mainly for the nobility, and the back room was used for the slightly less prestigious local customers – the wives of prominent Newark industrialists or councillors. A heavy curtain divided the back fitting room in two, and helped to conceal an old-fashioned commode provided for the use of customers. On the ground floor, behind the plate glass window, was the Ware Room, the room first encountered by clients as they entered the premises from the street. Although conveying an air of opulence and good taste, being thickly carpeted and generously hung with plush velvet, very little of the stock was on display. The Ware Room acted largely as a reception area for customers to be escorted to the private fitting rooms on the first floor. This page was added by Sue Waller on 07/12/2010. My mum, Sonia Clayton nee Brown was an apprentice court dressmaker with Madame Cooke. I beleive that my great grandmother worked here her name was Mauld Victoria Moody. Can anyone let me know if this is true ? Would your great grandmother have been working at the shop at the time of the 1911 census (or an earlier census)? If so, the census entry may help. Also, do either you (or the first respondent) have any memorabilia or information connected to the shop or photos of their relatives that we could add to the website?